RCA Records and Legacy Recordings, the catalog division of Sony Music Entertainment, will celebrate the 40th Anniversary of Elvis Recorded Live On Stage In Memphis with an expanded 2CD release of the monumental concert experience featuring tracks left off the original album (because of the spatial limitations of vinyl) plus a wealth of previously unreleased material. Elvis Recorded Live On Stage In Memphis will be available on Tuesday, March 18, 2014. The 40th Anniversary Edition of Elvis Recorded Live On Stage In Memphis may be preordered on Amazon (http://smarturl.it/elvis_ERLOSIM_amzn). 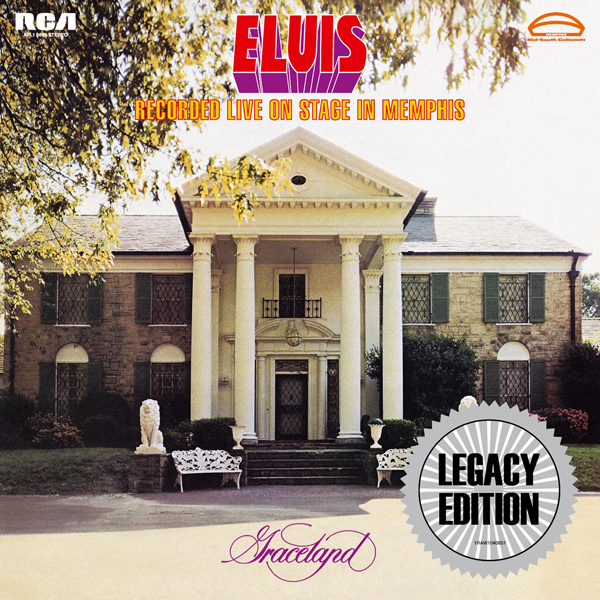 Disc 2 of the newly remastered expanded Legacy Edition of Elvis Recorded Live On Stage In Memphis presents for the first time a recently located recording of Elvis’ complete concert “test run” held for an ecstatic live audience on March 18, 1974, two days before his historic concert return to Memphis, where he’d last played live in 1961. The remarkable “test run” performance was recorded in MONO, drenched in the reverb Elvis preferred, and provides new insight into the magic of Elvis. As a special added bonus for Elvis aficionados, Disc 2 of Elvis Recorded Live On Stage In Memphis includes five intimate tracks (three of them previously unreleased) cut at the RCA Studios in Hollywood on August 16, 1974. Originally intended as reference recordings for an upcoming Las Vegas engagement, the performances—which include “Down In The Alley,” “Good Time Charlie’s Got The Blues,” “Softly As I Leave You,” “The First Time Ever I Saw Your Face” and “The Twelfth Of Never”—-provide a rare fly-on-the-wall glimpse into Elvis’ consummate backstage artistry as he prepares these songs for concert. The musicians backing Elvis on Elvis Recorded Live On Stage In Memphis include James Burton and John Wilkinson (guitars); Charlie Hodge (guitar and vocals); Duke Bardwell (bass); Ronnie Tutt (drums); Glen D. Hardin (piano); The Sweet Inspirations, J.D. Sumner & The Stamps, Kathy Westmoreland (vocals) with Joe Guercio and his Orchestra. Elvis Recorded Live On Stage In Memphis will include a 24 page booklet featuring rare photos, previously unseen memorabilia, new liner notes, press clips and more. Following the artistic success of his 1973 Stax sessions and the global phenomenon of the Aloha From Hawaii Via Satellite album and broadcast the same year, Elvis opened 1974 with a 15 city tour routed to end in Memphis and a state-of-the-art concert recording. Originally released on vinyl on July 7, 1974, Elvis Recorded Live On Stage In Memphis reached #1 on the Country charts and featured “How Great Thou Art,” the track that would bring Elvis his third (and third Gospel) Grammy win.